If you are looking to prepare your child for a life of learning and academic success, then you will be thrilled to know that our child care providers use FasTracKids® for our Toddler + curriculum. FasTracKids® uses innovative technology to teach your toddler important skills, including critical thinking, creativity, confidence, teamwork, and communication. At Palm Academy, we use this program to help ensure that your child is actively engaged in developing, growing, and learning! Kindermusik is another important part of our toddler/preschool curriculum. This enrichment program includes music and movement, and it was designed to nurture mental and physical development. Young children are learning so many new skills at once that it can be difficult to cultivate them all at once. Kindermusik incorporates language, social balance, emotional stability, and physical skills all into one activity that is fun for the kids! 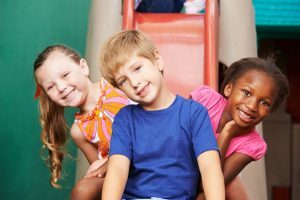 At Palm Academy, we involve a wide range of enrichment programs for our toddler age group because we understand what a critical time in their development these years are! Contact us today to learn more about Kindermusick and our head start preschool! In addition to our academic programs, we have chess classes, writing workshops, piano lessons, dance classes, and other learning services that are offered for a small fee. We always go above and beyond to ensure that each child has plenty of fun mixed in with our enrichment programs. Ask us about our Kyoko’s Art Classes for additional drawing and artistic development! Using hands-on lessons that help children learn by doing, our compassionate and courteous staff organizes a variety of daily activities. We focus on social development, creativity, and cognitive skills around math and literacy to develop a love of all learning. 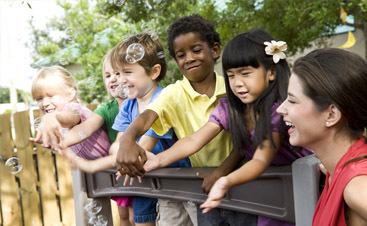 Individual attention is balanced with group activities to promote both confidence and cooperation, providing a strong, positive educational foundation. 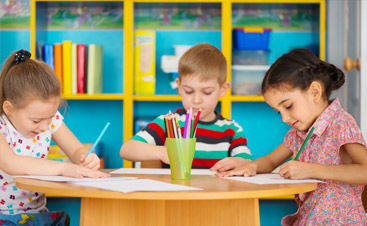 At Palm Academy, Inc., you will find a Fremont preschool with teachers who genuinely care about your child. Our locally owned and operated center welcomes your participation and involvement. Call or come by today and see all that we have to offer. 8:30 – 9:00 Greet Children/ Set Up Table Activities: playdough, coloring, etc. 9:00 – 9:15 Circle Time: flashcards, weather, calendars, etc. 9:15 – 9:45 Circle Time: Calender, Songs, Flashcards, etc. As Pre-K children gain more self-esteem, they feel ready to take on the world. Our Early Pre-K program enhances that confidence by providing activities to help children become problem solvers and lifelong learners. Through Pre-K children develop early literacy, mathematics and social skills through hands-on learning activities and independent exploration. They also have special time for running and jumping to keep them active and healthy! 11:30 – 12:00 Move and Groove Nursery Rhymes Story Times and Activity ABC Music & Me Fun Friday! The Kindergarten class does ABC Music and Me once a week, where students learn about music, composers, and even some music theory. The program also offers handwriting practice which leads up to writing practice by the end of the school year.